Owen Wister's 1902 western novel The Virginian was one of the first great novels of the American West. Set in the semi-mythical town of Medicine Bow, Wyoming in the 1890's, it chronicles the lives and relationships of the people who came out west and settles the wild land. 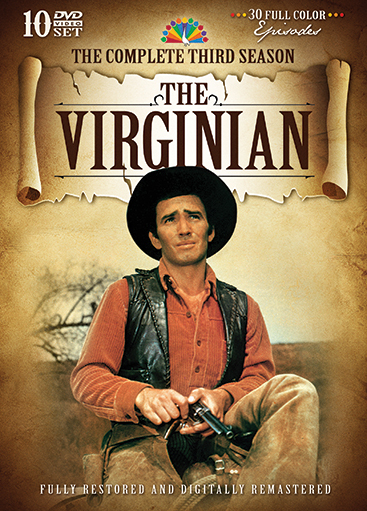 Starring James Drury in the title role, The Virginian was the first 90 minute television western, airing in prime time on NBC from 1962-1971. 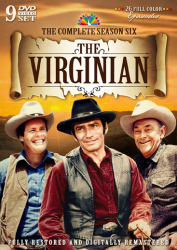 The stellar cast included Lee J. Cobb, Doug McClure, Gary Clark and Roberta Shore, and each week brought talented guest stars to The Virginian. Season Three's line-up includes Robert Culp, Slim Pickens, Rory Calhoun, Jack Warden, Ben Johnson, Ida Lupino and many more. Includes "We're a Lost Train" the final episode of the season, which became the pilot of the hit comedy-drama western Laredo, starring Peter Brown, William Smith, Philip Carey and Neville Brand!